After leaving the farmlet in Petaluma, we headed north. We overnighted in Fort Bragg along the coast. This is a prime example of how things aren’t always as glamorous as they may seem. And it was, as long as you were looking out at the horizon and not at the human feces just a few paces out the door. Seriously people…you’re gross! There were several people pulled off to overnight here, and let's just say, we weren't completely comfortable with our neighbors. If you have to go outside, watch where you step. Better yet, just enjoy the sunset from inside your rig. Before we got to Fort Bragg, there was a bit of a joke going on with some friends on Instagram that this place was cursed. Friend #1 said they had been there a couple days then someone pulled up and dumped their black tank right next to their rig! (for those of you who don’t know what a black tank is, its the holding tank that holds you’re crap, and highly illegal to dump on the ground) Then a few minutes later out the other side of their rig they saw someone taking a dump leaning up against the side of their van! I mean seriously people! So gross. Friend #2 went there to spend one night and when they got there and opened their door to their Airstream, it was flooded! I can’t remember exactly what caused it (maybe left the water pump on and faucet jiggled loose?) but they had to go to a campground and pull up their flooring and dry it all out. We were like, 'well…that’s just bad luck!' We got there and unhooked the trailer from the truck. Jonathan came in and shut the door and tried to go back out, but the handle didn't work…locking us inside our Airstream! Ha! Maybe this place is cursed! Luckily, we have a window right next to our door so we were able to remove the screen from the window next to the door and pop the window open so that Jonathan could reach around and open the door from the outside. (there is always something to fix when you live on the road..and really, in a house as well!) We’ll just fix it at the next stop! The next morning I took the kids down the road to Glass Beach while Jonathan got some work done. It was early, foggy, and cold so we didn’t spend much time searching for sea glass. I assume we didn’t venture out far enough as all we saw were tiny little, tiny pieces of the glass. Nothing like what you see on Pinterest. However, it could be that the bigger sea glass is just in a different location. If we had more time, we would have wandered up the beach to check, but we didn’t want to stay in Fort Bragg longer than we had to. We decided to take the Avenue of the Giants road up to our next stop! What a beautiful drive, being amongst some of the oldest trees around. We had to pull off at the visitors center and check it out. We took a short hike out to see some of the oldest trees in the park. It was really magical to be among these giants. Hopefully one day we'll come back and have more time to explore this area. 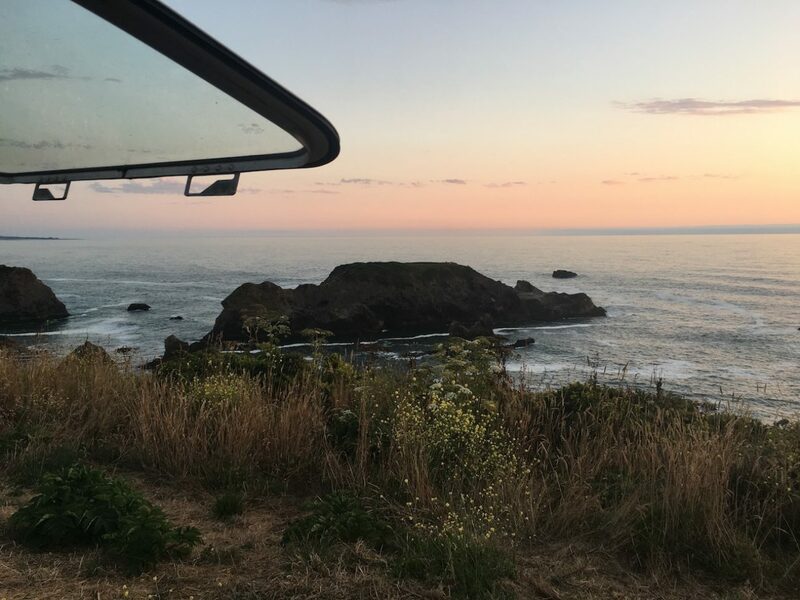 We had reservations for a few nights at Harris Beach State Park and were very anxious to get there and have a bit of downtime, plus we had to fix our broken handle! We found a great of a state park! If you find yourself near Brookings, OR, I highly suggest you try to get into Harris Beach State Park. It was crazy nice. They had so much for the kids to do. Ranger programs nearly every night and also programs during the day. The folks doing the ranger program were so nice. They knew what they were talking about, they were super patient with the kids, and you could tell they actually enjoyed being there. We’ve been to a lot of parks and a lot of Junior Ranger programs but this one has by far been the best! Nice private sites, clean bathrooms and showers, friendly workers. What a gem! We were so glad we were able to stay there a few nights. It also gave us time to fix that door handle! Oh, repairs. We always think it will be quick, but alas...it's usually twice as long as we thought. Once we figured out how to remove the old handle, it was a pretty easy switch. Luckily, when we bought this Airstream, they guy selling it had a spare handle! A ‘new’ handle for this rig would have been round $400-$500 so I’m so glad we had the spare! We switched it out, caulked it up and we’re good to go! There are several trails out to the beach from the park so we took one to Rock Beach which lead us over piles of driftwood and boulders. We spent so much time searching the tide pools, examining the life on the rocks and just taking in the scenery. We were really kicking ourselves for not having a kayak to go through this keyhole in the rock! The kids would have loved being able to paddle out around the huge rocks in the water. This part of the Oregon coast is stunning and I’m so glad we were able to spend some time exploring the area. We’re on a mission to get up to Olympic National Park so onward we go!